Yes I am finding that incredibly tough. But the wonderful thing is, nursery now is great. Where my son would always cry every year at the Xmas Concert and this year I had to sit on stage with him, here, he stayed up on stage beautifully, and went up for his certificate at the end. He even played the part of one of the men in the song Flying Saucer. So if you have ever considered changing your child's nursery or school, I would say think long and hard about it. Don't ignore your gut instincts, as it may be the best thing you ever do. He's like a different boy. Very proud Mummy today - well done Aaron. I won't say much more as we are back there for a party this afternoon, so I need to have lunch. The concert was this morning and as Wednesday isn't one of his nursery days, we came home afterwards, and will then go back for the party. As he is in my care today, I get to go too. Hoorraaah! I have worked in several nurseries - some good, some just awful. I would have to agree with you Liska. You never know what is happening at these places and if your child no longer seems like your child, definitely change nurseries. Onwards and upwards and into the next era. We are also starting school in September and I'm very excited to have a schoolgirl. Aww! I sort of know how you're feeling....On Friday my eldest finishes Primary school ready to start secondary school in September! I'm dreading it!! I'm dreading the solo walk home come September when my youngest starts school. I'm trying to look on the bright side by planning a schedule with time for a walk, yoga and writing, but to be honest it's still going to be tough. My son finishes nursery tomorrow and moves onto the school nursery in September. I know the school nursery is more about learning than playing as they want the kids to be able to read and write once they start school. I don't think he is going to like that! Tomorrow is my twins last morning at nursery and I can't believe they'll be going to primary school. Good luck come September! Glad he's happy at his new place, it makes such a difference to their learning journey. 2 of my children have left nursery and I cried both times!! It's such an emotional time but it is also really exciting! Good luck for September! Glad he is happier now! My eldest starts nursery school in September... I'm excited for him as I know he will love it, but dreading not having my right hand man round in the morning a! Your little boy is growing up and his confidence will grow with him.He is so sweet and looks really happy at nursery now. It can be such a bittersweet moment seeing them grow up and going through these stages. Hope you both have an amazing summer together before September. I had to change the nursery for my son a few times. I just didn't like the way he acted when I left him in the morning and when I came to take him home. The third one was the charm and it was such a happiness see how he loved to play with his friends and enjoyed time with his teacher. 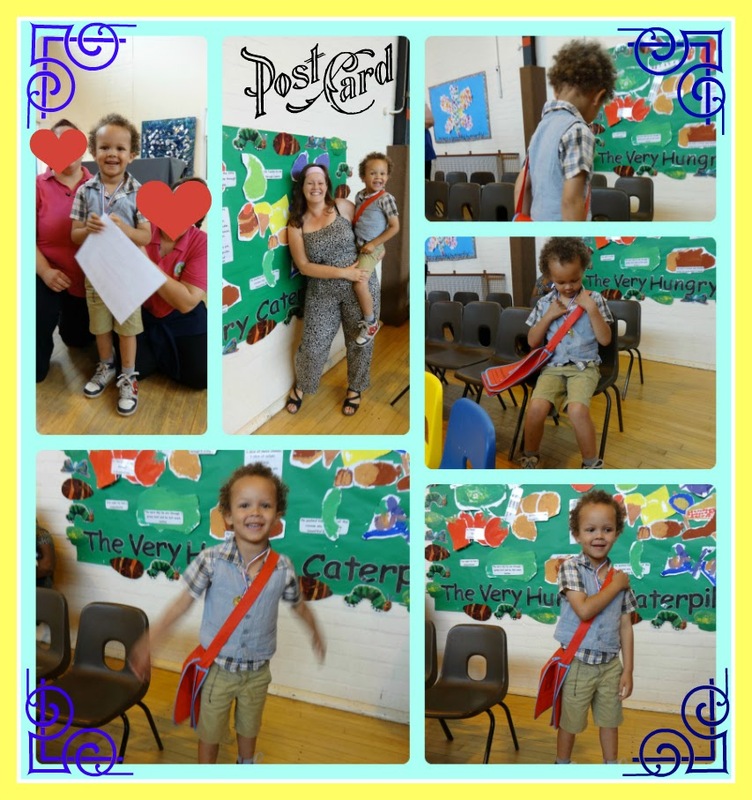 Your post card is fab! Hope the party was a success. Awww, children grow up so fast. I hope you have a lovely summer and manage to make a lot of memories. I think that you do have to go with your instincts sometimes, especially when your children are involved - have a great summer!